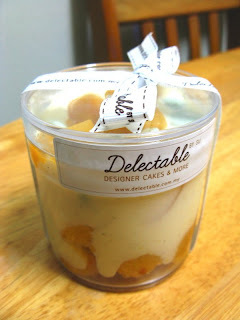 Just before we head to Midvalley, I paid a visit to "Delectable by Su" again. They sell very cute, pretty looking, and of cos' DELICIOUS dessert there. Checking out anything new on the shelf... I just LURVE dessert~ Lookie what I found this time! Gawd... I didn't check what's this called! But what's important is to know that this taste absolutely GREAT!! Soaked sponge cake topped with cream (custard?) & cubed peaces & pieces of chocolate too! Everything goes really well together, fruity... creamy~ chewy! I'll definitely go there and get 1 again! Can't wait! Iranian food is nice. I went to one near Jalan Changkat in KL. Awesome taste. And all the workers are Iranian (good english speakers, btw). Food cost MYR20+ and above. Well worth it. T T I forgot the name of the restaurant, though. LoL I think it was "Persian...."
I love Middle Eastern food since it's a nice balance of vegetables, grilled meats and rice - looks like a delicious meal! Tim : I'll find out where is it and go there and try out the food!! LOL! Is is around Bukit Bintang Area? Yeah it's somewhere in that area. LoL I only went there once, though. 2 years ago. i think the dessert is called peaches and dream, iranian food is always nice, esp like the yoghurt sauce. @ Vivien : Yeaps.. It was called Peaches & Cream, can't have enough of that. 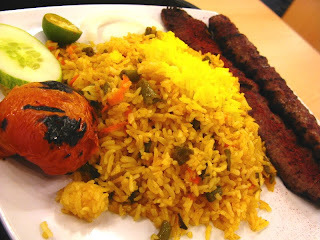 Hehe..
Owh.. any good iranian food to intro around KL?